I’ve been really busy with uni so, as usual, I’ve been procrastinating by making costuming plans without actually doing anything constructive. Since my 18th century plans are basically made and waiting on me finding time to carry them out, I’ve mainly been thinking about Regency. I’ve got a couple of fabrics put away that I bought because I thought they might make good Regency things. The first is a printed quilting cotton in green and blue. I think the print is technically Civil War era and I know quilting cotton’s a bit heavy, but I think it’ll be good for a more practical day dress. I’ve been thinking that a drop-front gown could be a fun thing to try and it’ll make it more practical, so that’s the plan. I like this dress as a fairly plain drop-front with a gathered front and this one has really cool braided trim around the neckline, although it may not look as cool without stripes. I also bought some white silk chiffon with little woven dots, which I think would make a fantastic evening dress but I’m having trouble coming up with something interesting to do with it. I’m not really into the super-decorated flouncy things from the later period, but it want it to be more exciting than just a white dress. So I have to think about that, but at least I know that I need to make a petticoat to go under the chiffon (which I could use for some of my other dresses). Then, I don’t remember why, but I was looking through a book I bought in Denmark about Louise Auguste, published by Rosenborg palace, which happens to have some very lovely extant regency-era costumes in it. In particular, it has two amazing silk velvet dresses. 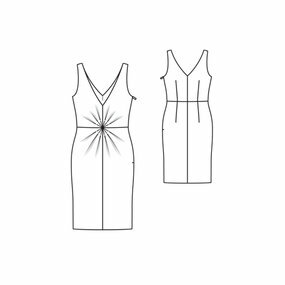 It also has a pattern diagram for one, though sadly it’s for the one that I like less, but I’m thinking I could do something that uses the bodice and skirt of the one I like more and the sleeves of the one that has the pattern. It seems like the collection isn’t online anywhere so I can’t find any pictures except what’s in the book… Anyway, I think it would be a really cool project, so we’ll see how that goes. And finally, since it looks like I’ll be starting on a reasonable number of Regency projects, I think I might be weakening on the stays front. I’ve always been a bit worried about the ‘regency stays will make you look like you have no bust’ thing, but I’m feeling better after looking at lots of pictures of European royalty looking for pictures of those dresses. And short stays should be reasonably quick to make. And they can’t be as slow and painful as the 1780s stays. I’ve only just started venturing into independent modern pattern companies. I’d seen the Colette patterns at the local fabric shop but wasn’t sure how good they’d look from looking at the illustrations. Then I saw some pictures online and decided to give them a go. I even found some perfect fabric (on sale!) to do a Rooibos, but I when went to to the shop the only dress pattern they had was Ceylon. I decided to try it anyway, which was possibly not the best idea, given how many pieces it has – it probably wasn’t going to be that quick to whip up just to see how I like the pattern company. However! All went well. I love the cute booklet and the clear instructions. The slightly unusual construction of the yoke went together beautifully and the finished product is comfortable and flattering. I now know which sizes fit me and that I can probably get away with less fabric than the pattern says. So now I want more! But where to start? 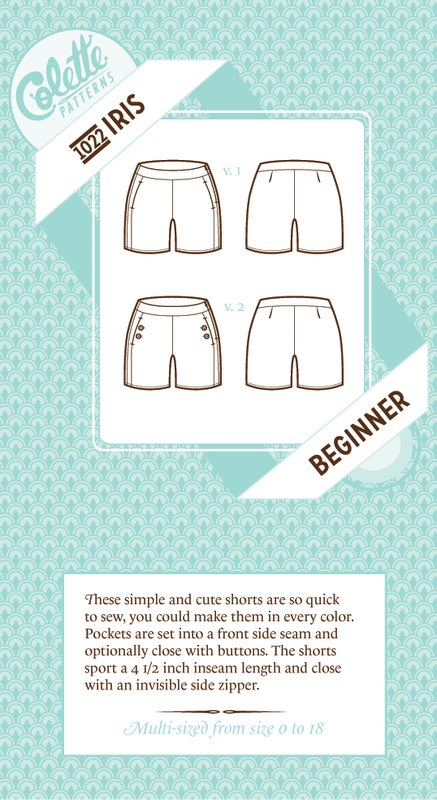 I wasn’t that inspired by the Sewaholic patterns – Lonsdale is a bit angular for me, and I’m not that enthused by sewing tops. But the other day I saw the Cambie dress and I LOVE it, so I’m very willing to be converted. 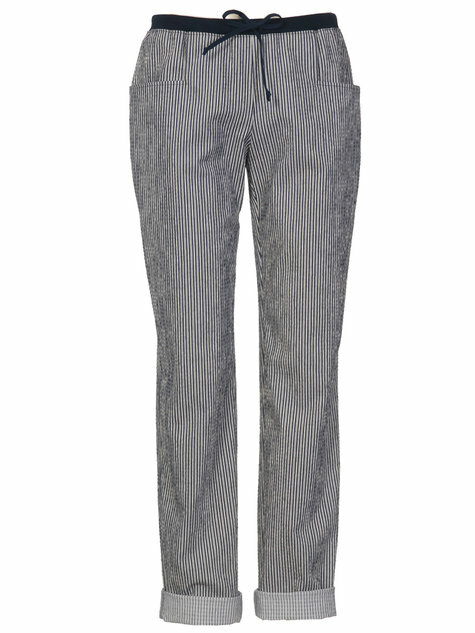 I want some lightweight pants for our trip to Turkey, so I should start that. 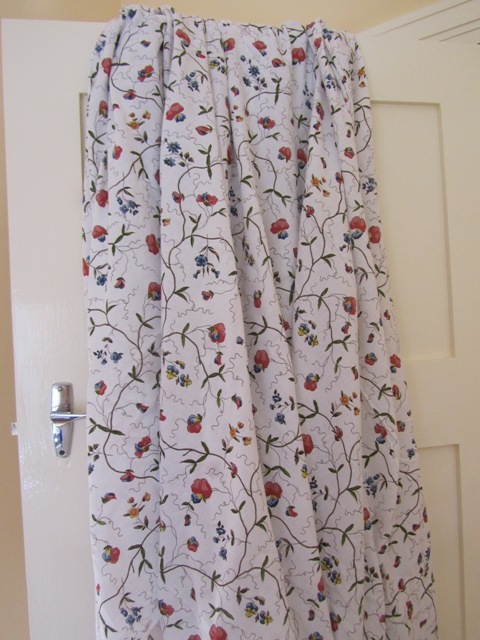 I also have some Liberty fabric to do a skirt, plus a couple more pieces I haven’t decided what to do with. Plus I love this patttern. 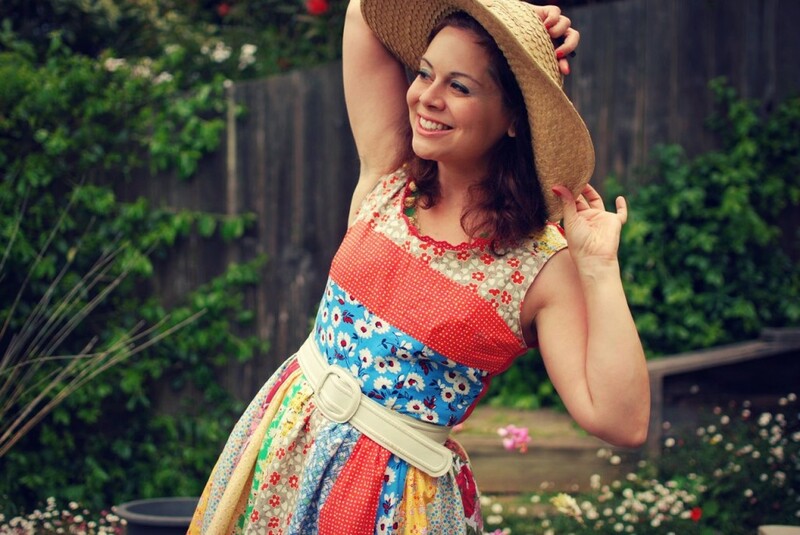 And this dress, which could work with the Burda pattern I’ve used a few times. Not enough time! So many patterns to buy, and make! I’ve decided that my blog needs a bit of a revamp. I’m very slack about updating it and I think this is largely due to the fact that it’s so costume focussed. I haven’t been doing much costuming recently, for various reasons, but that doesn’t mean I haven’t been doing anything! So I’ll be making things a bit more general and trying to update more often. I’ve been really enjoying sites like The Sew Weekly and BurdaStyle, they’ve been inspiring me to get back into making everyday clothes, so there’ll be more of that, as well as some crochet, cross-stitch, general craft and, hopefully a bit later in the year, some diy and home decoration! And still some costuming, when I get inspired. 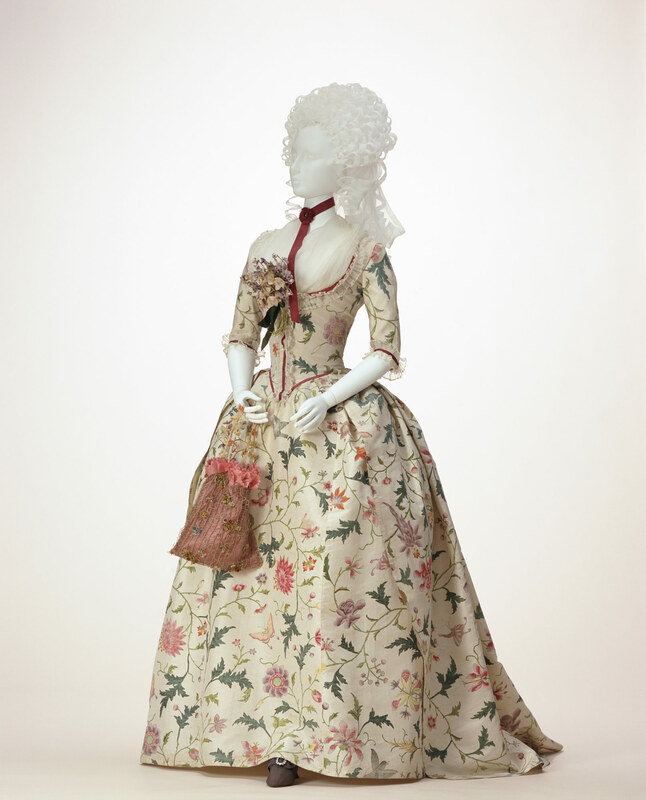 The first C18th dress I want to do is a chintz day dress. I saw a few that I loved in this style in Europe, such as this one from the V&A. I’ve got an Ikea doona cover that I’m going to use as the main fabric. In fact I’ve got 2, because I liked it so much I decided I wanted one to use as a doona cover as well. I’ve got about 6 pillowcases as well, which I can cut into if need be. The advantages of this are that it was cheap, I can probably get another set if it goes horribly wrong, and the fabric is quite soft, as it’s not designed for quilting or anything. The pattern probably isn’t 100% historically accurate, but I think the effect is close enough for a first go. I ordered some fine cotton voile to make a matching petticoat, but it turned out to be a very stark white which makes the Ikea fabric look too yellowy, so I’ll use it to do an under-petticoat, and some softer white voile from my stash for the proper petticoat (both are very fine, so I’m assuming I’ll need at least two). 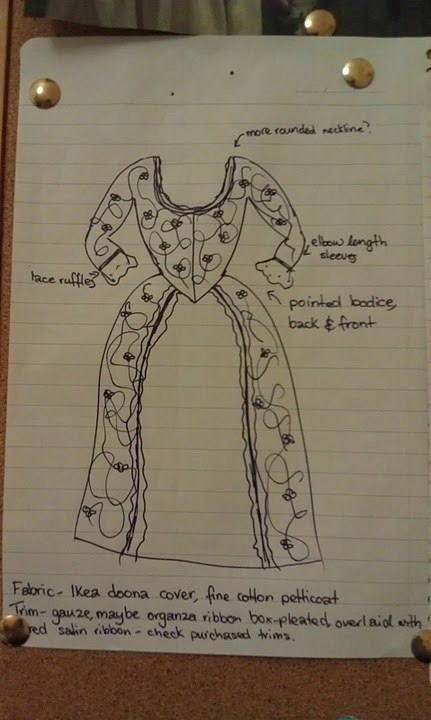 In terms of cut and pattern, I’m using Sense & Sensibility’s Portrait Dress pattern. 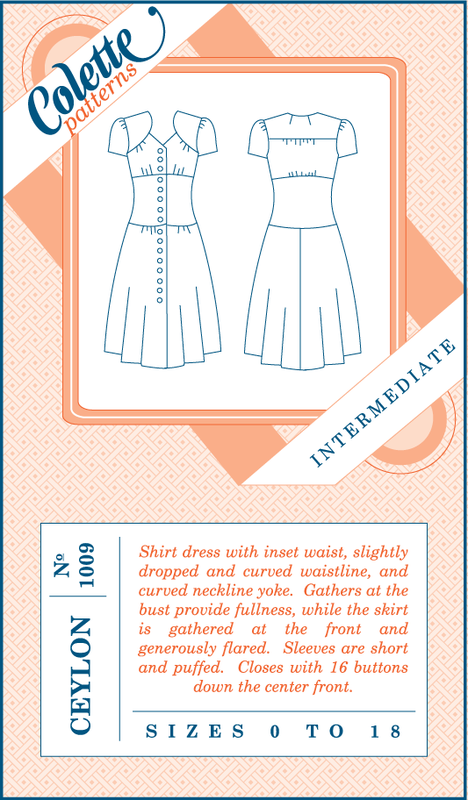 I’ll use the lower neckline and try to achieve something gently curved. I’ll cut the bodice with a pointed front and back and elbow-length sleeves. By way of trimming, I’m thinking of doing something similar to this dress, from the Kyoto Costume Institute. I like the soft organza and bolder colour of the red. I’ve got some silk organza to make a kerchief and I may have some offcuts for the trimming – I’ll see how I go, otherwise I can order more. This might be a longer-term plan – from what I’ve seen, very little decoration is also acceptable. I also bought a couple of metres of very beautiful, wide lace to trim the cuffs with. 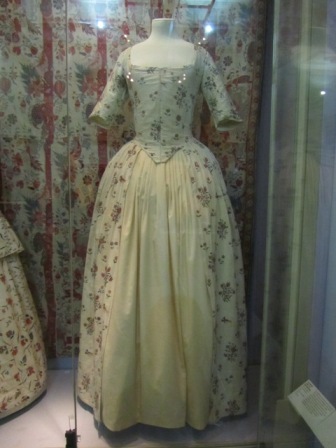 I think this will probably date the dress a little earlier than the 1780s I’m going for – most of the soft, frilly decoration seems to be a little earlier, though it’s probably hard to tell as lace is the sort of thing that might get transferred from dress to dress. Anyway, the lace is beautiful and I think I’ll gather it onto some bias tape so I can remove it easily. Oh, and I’ll probably attach some ribbons and buttons so I can turn the dress into a polonaise, depending on how I like it better. Basically, the original idea was to make a version of the dress in this picture for the Northanger Abbey theme of JAFA this year. I chose it because to me it looks a little Gothic, with the opulent colours, trimming and lace edging at the neckline, and I could imagine that it’s the sort of thing Catherine Morland would’ve liked. I’d had the picture sitting on my computer for a while so I decided that before I started serious work I should work out where I originally got it from… And then the problems began. I figured out that it was actually from a series of German plates of ‘The History of Costume’ from the 1860s-70s. So, not exactly primary source material, although that doesn’t necessarily mean it’s inaccurate. But I did think I should find some evidence for the various elements of the costume. 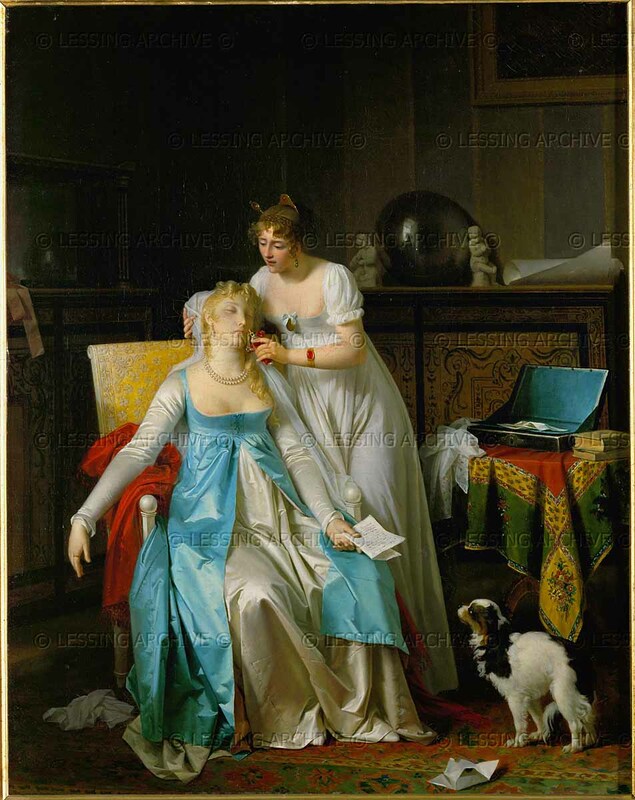 The first is in the Louvre, from 1804. My boyfriend took a photo of it on his phone and I discovered it the other day, then tracked down a bigger version. I like the lines of it and the way it seems to lace closed at the front (though I might raise the neckline a tad). I’d also add some decoration. 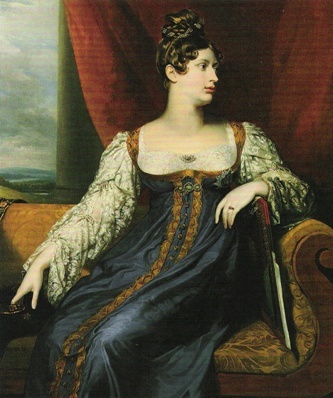 The second is a portrait of Princess Charlotte in 1817 (so a bit later). I don’t like the lines quite so much and some of the trimming is a bit much for me, but I like the colour scheme; it basically matches the fabric and braid I already have. So I think what I’ll do is an overdress thing along the lines of the Louvre painting, though I’m not sure what length I’ll do the skirt yet – 3/4, full or trained – and then play with trimming to work out what looks nice. It might need hooks and eyes for now since I don’t think I’ll manage eyelets for lacing before the festival. Well, I’m going to try to start a blog for all my costumes and various other making stuff type things. It probably won’t be very in-depth, but there will be pictures and hopefully some discussions for those interested.